Finding land to spread sludge is also becoming a major problem. Around growing urban centers, it is becoming more difficult each year to find landowners who will accept spreading of biosolids on their property. There are the worries articulated above, plus the problem of odors and groundwater contamination, especially during rainy periods, and simply the aesthetic consideration of such disposal. 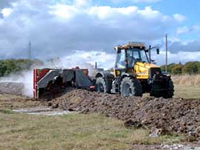 Pelletizing is a multistep process of anaerobic digestion, dewatering, drying the sludge and forming it into small solids that can be easily transported to wherever fertilizer is needed. Composting is what the name implies: further treatment through biological digestion. Neither of these forms of fertilizer, without considerable further treatment, eliminates heavy metals. Many wastewater plants pelletize their sludge today and many more are considering it for tomorrow. 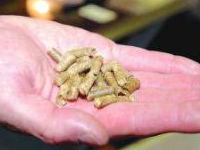 However, pellet plants are very expensive to permit, build and operate (they are fuel-intensive) and the market for pellets is rapidly becoming saturated. As a consequence, some municipalities are paying to have the pellets hauled away. 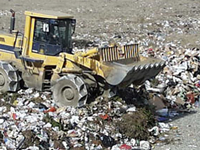 Landfills have traditionally taken a significant percentage of sludge for disposal. With the negative health concerns from heavy metals and pathogens, plus the production of methane (a severe greenhouse gas) by the anaerobic digestion of biosolids in landfills, several states (e.g. Florida and California) are actively considering banning the use of landfills for the disposal of biosolids produced by wastewater treatment plants. Several states have reasonably extensive incineration programs to dispose of biosolids. The problems with incinerators lie in two directions. 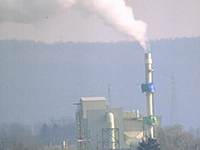 Among professionals working on environmental permits, there is a growing consensus that permits for incinerators may be impossible in many locations and, even if they are possible, they may take years to obtain. The second problem is the fact that incinerators give off stack gases that will most likely require scrubbers in the future. Not all material is consumed in a typical incinerator. Therefore, besides the CO2 produced, there could be heavy metals in the exhaust, nitrogen oxides, particulates and, in some cases, other organic or inorganic gases that are toxic. Complete scrubbing for CO2 capture is very expensive and difficult to retrofit on existing units. Incinerators also produce solid ash that must be disposed of in an environmentaly acceptable manner.